GrowNYC hosted markets along Coenties Slip in the fall of 2014. The weekly market will return on Thursdays from July 2 to Nov. 19, 2015. 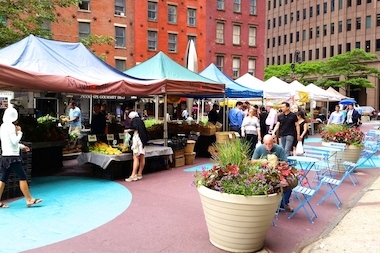 FINANCIAL DISTRICT — You'll once again be able to buy hard cider, fresh veggies and more at Water Street's weekly outdoor greenmarket. The market, which features seven farmers and vendors selling locally made cheeses and breads, along with produce, wines and hard cider from upstate New York, will return for a second season starting in July. Vendors will set up shop along Coenties Slip and Water Street, near Hanover Square, from 8 a.m. to 7 p.m. every Thursday from July 2 through Nov. 19. The greenmarket's organizer, nonprofit GrowNYC, is working with the Downtown Alliance to organize the weekly event. Along with food and alcohol for sale, the market will offer free recipes and weekly cooking demonstrations. For more information, check out the Water Street greenmarket's website.